Hull lost ground on the top two in the Championship as they slumped to a defeat at struggling Rotherham. Lee Frecklington put the Millers ahead from the penalty spot after Moses Odubajo tripped Kirk Broadfoot. Joe Newell doubled the lead for Neil Redfearn's side when he danced into the Hull area before hitting a right-foot shot off the underside of the crossbar. Chuba Akpom twice struck the post with second-half efforts as Hull failed to find a way back into the game. 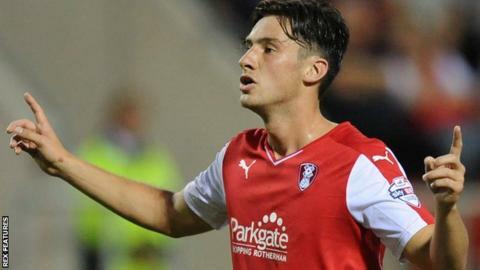 Rotherham's win, their first in four games, came just days after manager Redfearn said some of his players were not good enough for the Championship. His criticism seemed to have a positive effect as they took full advantage of Odubajo's clumsy challenge on Broadfoot to take the lead on 28 minutes, with Frecklington drilling the spot-kick straight down the middle past Allan McGregor. Jake Livermore had a header saved and Akpom curled a shot just over the crossbar as Steve Bruce's side searched for an equaliser before half-time. Akpom hit the foot of the post straight after the interval after Andrew Robertson played him in before Newell gave Hull a warning of what was to come, cutting inside off the left for a shot into the side netting. Seven minutes later, he made no mistake and thundered in his third league goal of the season from the edge of the area from Frecklington's pass. Hull spurned more chances as Akpom once again hit the post when put through on goal by Shaun Maloney, and Harry Maguire headed a late corner wide. "It was well deserved to be honest, right from the first minute. As a performance it was really pleasing. "There were some harsh words said and you can put one or two noses out of joint, but that is football, at the end of the day it's a business. "We have got to get results. We had a good reaction, the lads really responded well. "One thing they have done since I have been here is fought and they fought today, but they also passed well. We looked like a good side." "It's one of those horrible ones where you make mistakes, which we did. Gift them the opening goal, which gave them a lift, and then of course after that I don't know how many clear cut chances [we had]. "It's been one of those horrible afternoons where you gifted them goals and made mistakes defensively and hadn't been good enough in goal. "I know we hit the bar twice, but the chances that we've had, really we should be taking some of those." Match ends, Rotherham United 2, Hull City 0. Second Half ends, Rotherham United 2, Hull City 0. Corner, Rotherham United. Conceded by Curtis Davies. Attempt missed. Grant Ward (Rotherham United) right footed shot from the centre of the box misses to the left. Attempt saved. Grant Ward (Rotherham United) right footed shot from outside the box is saved in the centre of the goal. Assisted by Jonson Clarke-Harris. Attempt missed. Tom Huddlestone (Hull City) right footed shot from the centre of the box is too high. Assisted by Jake Livermore following a corner. Corner, Hull City. Conceded by Lewis Buxton. Attempt missed. Chuba Akpom (Hull City) header from the centre of the box misses to the right. Assisted by Shaun Maloney with a cross following a corner. Corner, Hull City. Conceded by Kirk Broadfoot. Attempt missed. Harry Maguire (Hull City) header from the centre of the box is close, but misses to the right. Assisted by Shaun Maloney with a cross following a corner. Substitution, Rotherham United. Tony Andreu replaces Lee Frecklington. Chuba Akpom (Hull City) hits the right post with a right footed shot from the centre of the box. Assisted by Shaun Maloney. Substitution, Rotherham United. Jonson Clarke-Harris replaces Danny Ward. Attempt missed. Luke Hyam (Rotherham United) right footed shot from the left side of the box misses to the right. Assisted by Joe Newell. Attempt missed. Danny Ward (Rotherham United) left footed shot from outside the box misses to the left. Assisted by Joe Newell. Luke Hyam (Rotherham United) is shown the yellow card. Allan McGregor (Hull City) wins a free kick in the defensive half. Attempt saved. Joe Mattock (Rotherham United) left footed shot from outside the box is saved in the centre of the goal. Assisted by Richard Smallwood. Offside, Rotherham United. Danny Ward tries a through ball, but Joe Newell is caught offside. Attempt blocked. Lee Frecklington (Rotherham United) right footed shot from outside the box is blocked. Assisted by Grant Ward. Substitution, Hull City. Adama Diomande replaces Abel Hernández. Substitution, Hull City. Tom Huddlestone replaces David Meyler. Chuba Akpom (Hull City) wins a free kick in the defensive half. Offside, Hull City. Shaun Maloney tries a through ball, but Abel Hernández is caught offside. Attempt blocked. Mohamed Diamé (Hull City) right footed shot from outside the box is blocked. Assisted by Abel Hernández. Attempt missed. Abel Hernández (Hull City) header from the centre of the box is high and wide to the right. Assisted by Ahmed Elmohamady with a cross. Chuba Akpom (Hull City) wins a free kick on the right wing. Goal! Rotherham United 2, Hull City 0. Joe Newell (Rotherham United) right footed shot from the right side of the box to the high centre of the goal. Assisted by Lee Frecklington. Attempt blocked. Danny Ward (Rotherham United) header from the centre of the box is blocked. Assisted by Joe Mattock with a cross. Substitution, Hull City. Mohamed Diamé replaces Moses Odubajo. Attempt saved. Chuba Akpom (Hull City) left footed shot from a difficult angle on the left is saved in the centre of the goal. Assisted by David Meyler. Attempt missed. Joe Newell (Rotherham United) left footed shot from the left side of the box is close, but misses to the left. Assisted by Lee Frecklington.